But the idea of diaspora is now ubiquitous and is increasingly used by academics, policymakers and the groups themselves to describe a form of identity and political orientation that is more fundamentally transnational and linked to the emergence of a global identity politics. The term has also proved useful because it allows politicians and activists to identify or create a new transnational actor or constituency—and then speak on its behalf. Technological advances allow for new political possibilities, a type of simultaneity or “time-space compression” in which it is possible for actors to engage in politics that are at once symbolically rooted in and referencing one state—often an idealized “homeland”—while being physically located in another. Global cities such as London, for example, act as important hubs for politics in places as diverse as Nigeria, Somalia, Iraq, Bangladesh and a host of other places that are connected to diaspora communities there. The “power of diaspora” is further intensified via social media. The Internet have given rise to “digital diasporas,” or groups that organize online on behalf of homeland causes. Virtual diaspora activity now spans the globe and can be mapped in ways that allow one to see the online linkages that connect Sikh groups in Canada and the United States orTamil groups in Toronto and London. These connections also allow for new forms of global political engagement and the coordination of politics beyond the boundaries of the nation-state. In the spring of 2009, for example, thousands of Tamil diaspora members took part in coordinated protests around the world against the final military offensive in the Sri Lankan civil war, with events in Paris, New York, Washington, Sydney, Melbourne, Geneva, Berlin, Zurich, Oslo, Copenhagen, The Hague and elsewhere. Similarly, last year during the battle for Kobani, Syria, Kurdish groups in London staged street protests against the so-called Islamic State (IS) and in support of Kurdish fighters. Online, the use of “hashtag politics,” such as the global #IPledgeOrange campaign that spread virtually across Sikh communities in 2012, constructs and reinforces a shared diasporic identity while allowing for transnational mobilization around a common political cause—in this case to protest the death sentence of Bhai Balwant Singh Rajoana in India. The old notion of assimilation has thus been replaced in some respects by simultaneity, as technology facilitates the possibility of ongoing engagement with the politics of an actual or ancestral country of origin, in addition to political activity and engagement in one’s country of residence. At the same time, invoking the term “diaspora” can be politically useful for a range of different actors. For example, states such as India, Nigeria, Turkey and Morocco are increasingly setting up formal “diaspora engagement” programs to encourage remittances and investment, to promote public diplomacy, or even to help keep an eye on opposition movements in exile. This is partly in response to the active promotion of the idea by international organizations such as the World Bank and International Organization for Migration (IOM). But it is also arguably related to the rise of outward-looking neoliberal economic policies in countries like India that seek to tap their diasporas as a source of foreign direct investment. Policymakers in the United States, Canada, Europe and elsewhere, however, are also increasingly looking inward to potential diaspora groups within their borders to draw on their specialized knowledge, cultural capital and global networks. These are used to help promote and achieve a range of policy objectives, whether it be facilitating international trade, encouraging economic development or pursuing strategic and geopolitical objectives. The United States Agency for International Development (USAID), for example, engages in diaspora politics to encourage overseas investment, philanthropy and development, and the U.S. government draws heavily on the expertise and networks of Asian-Americans to facilitate trade with Asia. The Department for International Development (DfID) in Great Britain has similarly sought to engage U.K. diaspora communities as part of its foreign aid and international development strategy. National governments, however, are not the only actors harnessing the power of diasporas. International organizations such as the World Bank and the African Union seek to engage diasporas in their development programs and policies. Politicians and political parties increasingly seek support from diaspora populations abroad when campaigning and seeking office. 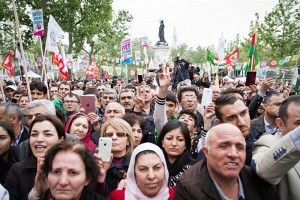 For example, in the run-up to Turkey’s June parliamentary elections, all the major political partiescampaigned among Turkish diaspora communities in Europe. New York City is an important campaign stop for candidates running for election in the Dominican Republic. Even armed insurgent groups can get into the act of seeking diaspora support as a means of securing external funding, legitimacy, political clout and, at times, recruits. Groups such as the Kurdistan Workers’ Party (PKK), the Kosovo Liberation Army (KLA) and the Liberation Tigers of Tamil Elam (LTTE) have all used this strategy in the past. Arguably, the diaspora politics model can also shed some light on the strategies adopted by non-national groups such as IS, who use identity politics, operate transnationally and encourage migration to a “homeland” as a means of securing material support from abroad. This all makes for confusing politics at times, as different actors and organizations may be competing for the political loyalties of the same diaspora group or seeking to represent them for different purposes. In the United States, there is no single voice that can legitimately speak for the “Jewish diaspora,” with organizations such as the American Israel Public Affairs Committee (AIPAC) and J-Street taking different stands on policy issues toward Israel. Indeed the very notion of invoking the term diaspora or homeland can be a political act, used to construct a constituency that can then be drawn upon later for political support. In many respects diasporas are “contested constituencies,” open to engagement and mobilization by many different types of actors for different purposes and agendas. A key challenge in this respect is to understand which actors are claiming to speak for a diaspora and why. A website and a business card do not always mean that an individual speaks for a large constituency. Diaspora politics can often include contestations over not only who speaks for a diaspora, but also who constitutes, or is part of, that particular diaspora. As the sociologist Rogers Brubaker has argued, a diaspora is a “field of competing political stances.” In many cases, there is intense intra-diasporic competition to be the legitimate “voice” of the diaspora, often based on political configurations back “home,” with old political rivalries and competition transplanted into and re-emerging in new contexts with new political stakes. What does all this transnational activity mean for the future of global politics? Observers of diaspora politics can be divided loosely into diaspora optimists and diaspora pessimists. Optimists view diaspora politics as ushering in an era of radical multiculturalism and acting as a cosmopolitan force for increased global understanding and integration. Pessimists see diasporas as contributing to a world characterized by growing fractionalization, conflict and violence, with rogue nonstate actors claiming to represent groups while lacking political accountability. The answer may lie somewhere in the middle, with national governments around the world having to learn to accommodate the fact of permanent transnational constituencies that connect the domestic politics of different states. Diaspora pessimists argue that diaspora politics distort national interests and intensify the likelihood of violent conflict, whereas diaspora optimists point to their role in facilitating diplomacy and resolving conflicts. Historically, pessimism about the impact of diaspora politics on security has been expressed in the language of fear about “dual loyalties” or the emergence of a “fifth column” during a conflict. This type of language has led to historical injustices such as the internment of Japanese-Americans in the United States during World War II. Such languagesuggests an image of states as closed containers that are defined by a homogenous national identity—an image has never matched reality and is even less pertinent in today’s world. There are similar debates between pessimist and optimists on how diaspora politics relate to violent conflict around the world. Some forms of diaspora politics have involved fundraising and mobilizing support for armed conflict in a real or imagined homeland. A World Bank study in the early 2000s suggested that countries with large diasporas abroad were 6 times more likely to experience a recurrence of civil war than countries with no diaspora. Conflicts in the Ukraine and Syria have both drawn support from diaspora groups abroad, but also from non-diaspora groups of foreign fighters. Diaspora politics is therefore just one aspect of the complex transnational dynamics of contemporary civil wars. Moreover, the relationship between diaspora politics and violent conflict is neither fixed nor automatic, but rather heavily dependent on the policy choices of the actors involved. In the conflict in Northern Ireland, for example, some in the Irish-American community undoubtedly helped to sustain the conflict through activities such as fundraising for the Irish Republican Army (IRA) via the Irish Northern Aid Committee (NORAID). At the same time, other Irish-Americans worked to resolve the conflict, and U.S.-based actors ultimately played an important role in the Northern Ireland Peace Process and the 1998 Good Friday Agreement. Diaspora optimists have pointed to the positive role that diaspora politics can play in promoting economic developmentvia financial or social remittances. According to the World Bank, global remittances reached $583 billion in 2014. Top recipients include India ($70 billion), China ($60 billion), the Philippines ($25 billion) and Mexico ($22 billion), and remittances constituted 52 percent of GDP in Tajikistan. Some countries, such as India and Mexico, have devised policies that encourage remittances and harness their power. Mexico’s 3+1 program, for example, links grassroots hometown associations in the diaspora with local infrastructural projects by supplying matching government funding for emigrant-supported projects. Yet there is also reason to be cautious about the role of diaspora politics in development. Remittances may exacerbate local inequalities in migration-sending states when recipients use them for consumer goods. And countries like Nigeria have suffered from the effects of brain drain when highly trained professionals, such as medical doctors, emigrate abroad.According to some accounts, 23,000 qualified academic professionals leave Africa every year. Around 150,000 Filipino nurses and 18,000 Zimbabwean nurses work abroad. Meanwhile, diaspora populations are diverse, and expectations to send money abroad can also place a heavy burden on individuals who may already be financially stretched trying to support and establish themselves. In short, optimism about the promotion of diaspora engagement as a means of economic development has to be balanced with an awareness of its human costs. Diaspora pessimists argue that “long-distance politics” create a lack of political accountability as activists engage in activities that affect outcomes thousands of miles away without being there to experience the consequences. An example is the case of the 1998 attacks on ethnic Chinese in Indonesia following the Asian financial crisis. At that time, a global Chinese Huaren diaspora, led by activists in the United States, mobilized on behalf of their “ethnic kin” in Indonesia. The ethnic Chinese population in Indonesia, however, resisted these efforts, asserting that they considered themselves to be Indonesian. In this case there was a gap between the demands of diaspora spokespeople and the interests of those they claimed to represent. This same principle applies to the relationship between state governments and “their” diasporas. There has been an increase in the extension of dual citizenship by states to diaspora groups abroad. On the surface, this would seem to indicate a rise in global democracy, but the reality may be more complicated. Citizens abroad can be more easily kept under state control. Debates about who qualifies as a country’s diaspora may also lead to a renewed emphasis on ethnic nationalism, when most forms of citizenship are becoming more and more civic. It is also possible that diaspora engagement policies by “home country” governments may be viewed as interfering in the domestic political life of other states. Turkish-origin citizens of Germany, for example, may not wish to be identified as part of a diaspora, and policymakers in France or Germany may not always be happy to see the Algerian or Turkish state, respectively, take an active role in the domestic affairs of their citizens, even if it is in areas that the latter have traditionally had a long involvement in, such as the provision of religious personnel and support. In a globalized world, political actors of all types are increasingly embracing the power of diaspora politics. Diaspora politics is not new, but it does have a new level of influence. This new age of global diaspora politics is defined by the possibility of permanent transnational constituencies connecting states, and the emergence of diaspora groups as “contested constituencies.” This alters the political landscape that states operate in by creating more complex policy environments and trade-offs, thus challenging the traditional divide between domestic politics and foreign policy. The emergence of diaspora politics creates challenges, but also opportunities. Most important, it is a structural feature of world politics in the 21st century that policymakers need to adjust to and accommodate. Love it or hate it, diaspora politics are here to stay. Fiona B. Adamson is an associate professor (senior lecturer) in international relations at SOAS, University of London. Her academic writing can be found on academia.edu and ResearchGate. Follow her on Twitter at @FionaAdamson.